Caravaggio (Michelangelo Merisi) (1571–1610), The Cardsharps (c 1595), oil on canvas, 94.2 x 130.9 cm, Kimbell Art Museum, Fort Worth, TX. Wikimedia Commons. For some, gambling is a vice and a quick way to perdition; for others it’s their main social activity and favourite entertainment. Many nations and societies have tried to ban it: it was illegal in the Roman Republic, except during the Saturnalia in December, and is strictly forbidden under Muslim law. It has been endemic in other societies and eras, including east Asian nations such as China during much of its recorded history. In this and the next article I explore how gambling has been portrayed in European paintings, from Hieronymus Bosch to Félix Vallotton. Because there are so many works showing games of cards, I focus more on other forms of indoor gambling, such as dice, table gaming, and gambling houses. Hieronymus Bosch (c 1450–1516), The Garden of Earthly Delights (right panel) (c 1495-1505), oil on oak panel, central panel 190 × 175 cm, each wing 187.5 × 76.5 cm, Museo Nacional del Prado, Madrid. Wikimedia Commons. 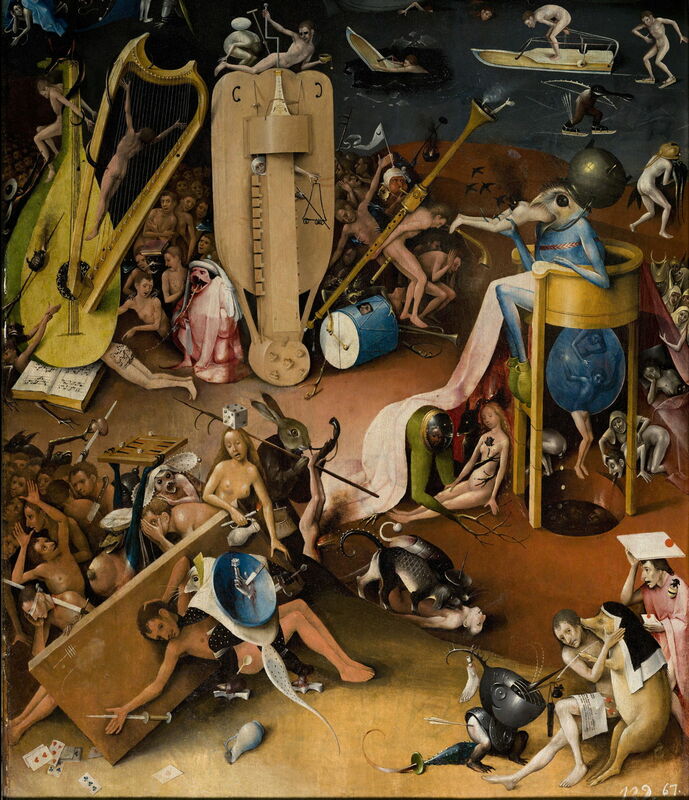 For Hieronymus Bosch and his patrons, gambling was definitely one of the cardinal sins. It appears in the garden of Hell in the right panel of Bosch’s magnificent Garden of Earthly Delights from about 1495-1505. In this damning conclusion, figures are mutilated and tormented in a nightmare landscape dominated by non-human creatures and alarming objects, where gambling takes the foreground. Hieronymus Bosch (c 1450–1516), The Garden of Earthly Delights (right panel, detail) (c 1495-1505), oil on oak panel, central panel 190 × 175 cm, each wing 187.5 × 76.5 cm, Museo Nacional del Prado, Madrid. Wikimedia Commons. In this foreground, a huge blue bird, wearing a cauldron on its head and swallowing a whole human, presides over the scene. That bird is sat on an elevated commode, defaecating blue bubbles containing the people it has been ingesting. Faces stare up from the foul brown waters of the cesspit underneath. The two main groups of victims here are clustered around objects associated with gaming and gambling, and those for making music – then associated with the work of the devil, and immoral activities such as dancing. There are playing cards scattered on the ground beneath an overturned gaming table, and dice balanced precariously on an index finger and on the head of a naked woman. From among that cluster of figures, a pair of dark blue non-human arms holds high a backgammon board with three dice. Attitudes to gambling were very different in Caravaggio’s Italy. In The Cardsharps of about 1595, a well-heeled androgynous boy has been tricked into a game of cards with a pair of crooks. 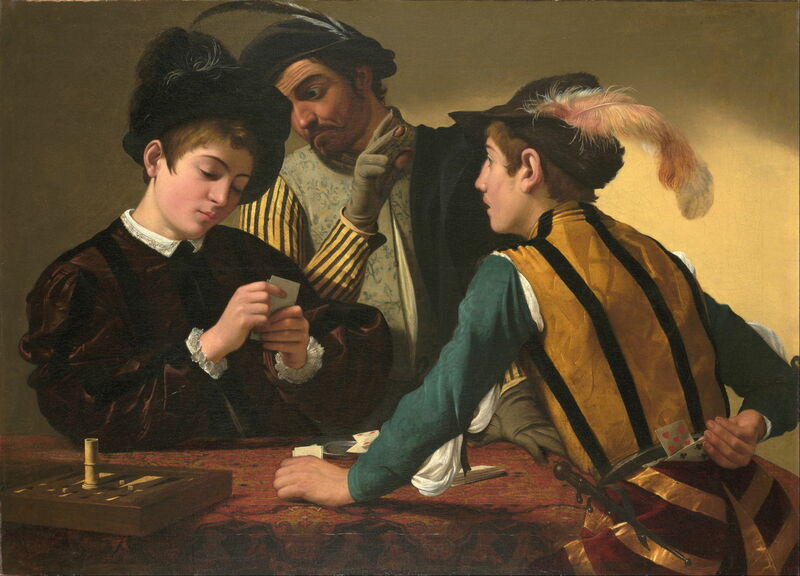 The older of the cheats stands behind the boy’s left shoulder, signalling the cards in his hand to his accomplice, a younger boy who is playing the game. The younger cheat has a couple of cards tucked behind him, and is reaching for one of them with his right hand. Secured very visibly to his belt is a small dagger. At the lower left corner is a backgammon set, with three tiny dice on the board. Caravaggio’s painting was a great success, so was copied with various degrees of fidelity, and inspired other similar works. 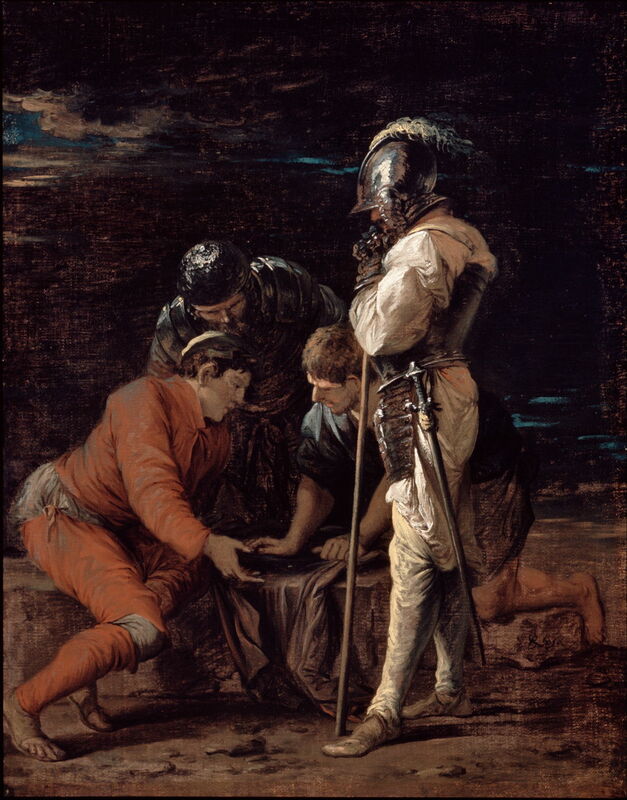 Valentin de Boulogne (1591–1632), Soldiers Playing Cards and Dice (The Cheats) (c 1618-20), oil on canvas, 121 × 152 cm, National Gallery of Art, Washington, DC. Wikimedia Commons. 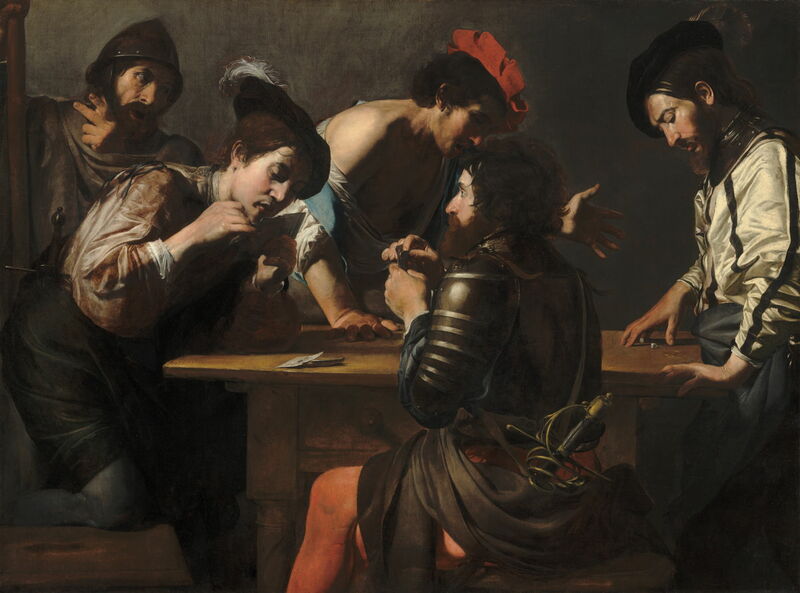 Valentin de Boulogne’s Soldiers Playing Cards and Dice (The Cheats), from about 1618-20, elaborates the motif with a larger group of men, the signalling accomplice seen at the upper left, and another pair playing dice. From long before the Roman army, soldiers had been identified as being specially prone to gambling. Georges de La Tour (1593–1652), The Cheat with the Ace of Diamonds (c 1635), oil on canvas, 146 x 106 cm, Musée du Louvre, Paris. Wikimedia Commons. 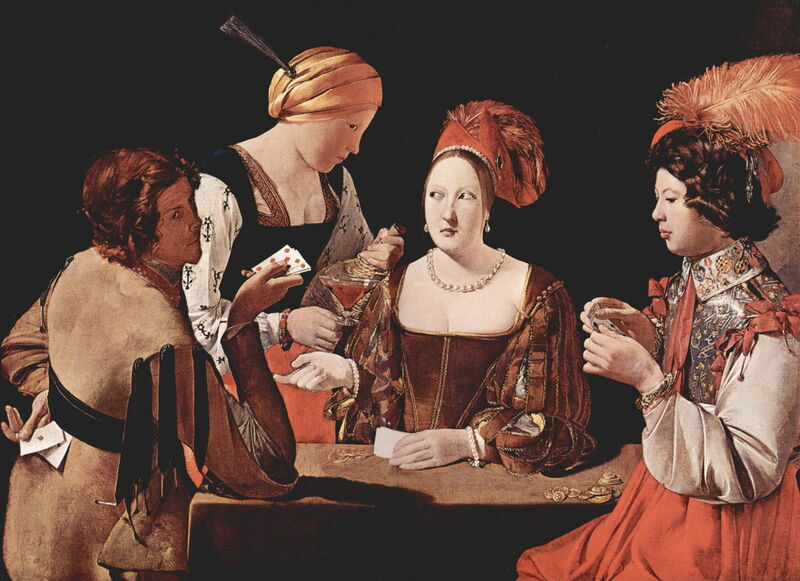 Georges de La Tour’s The Cheat with the Ace of Diamonds (c 1635) develops the motif further. There are now three figures playing cards, and their money is laid on the table. At the right is the victim, another androgynous boy, his eyes cast down at his hand of cards, and a large pile of gold coins in front of him. At the right, a dashing man glances sideways at the viewer, his cards almost concealed in front of him. His left hand reaches behind him to pluck the ace of diamonds from under the belt on his back. But the courtesan sitting opposite in a low-cut dress isn’t above suspicion either. She looks shiftily towards the maidservant who has just filled her drink, and the maid looks sideways towards the victim, as if the two of them are also conspiring to cheat him of some of those coins. He is just about to learn the hard way of that dangerous combination of gambling, loose women, and alcohol. David Teniers the Younger (1610–1690), The Dice Shooters (1630-50), oil on panel, 45 × 59 cm, Rijksmuseum Amsterdam, Amsterdam, The Netherlands. Wikimedia Commons. Alcohol, and that other vice tobacco, are cited in David Teniers the Younger’s The Dice Shooters (1630-50). 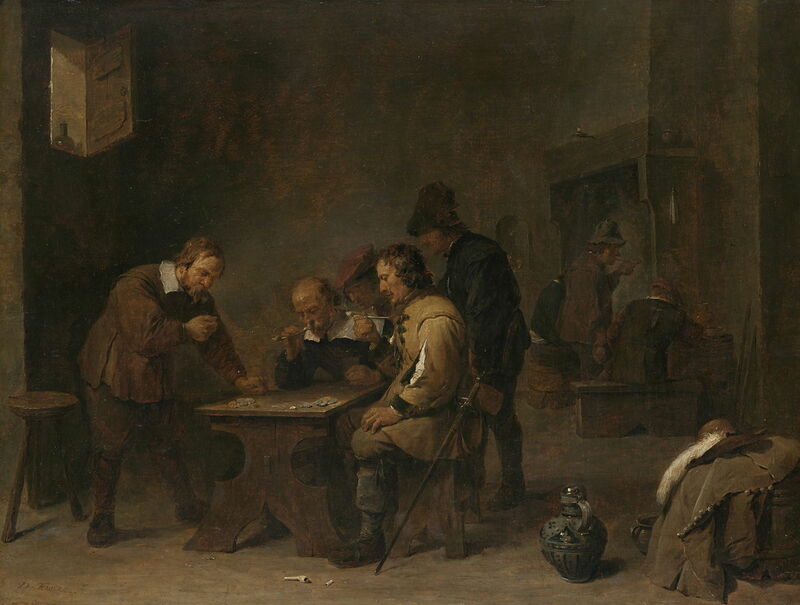 In common with many other paintings of card-playing and gambling in the Dutch Golden Age, it is set in a dingy room in a rough tavern. 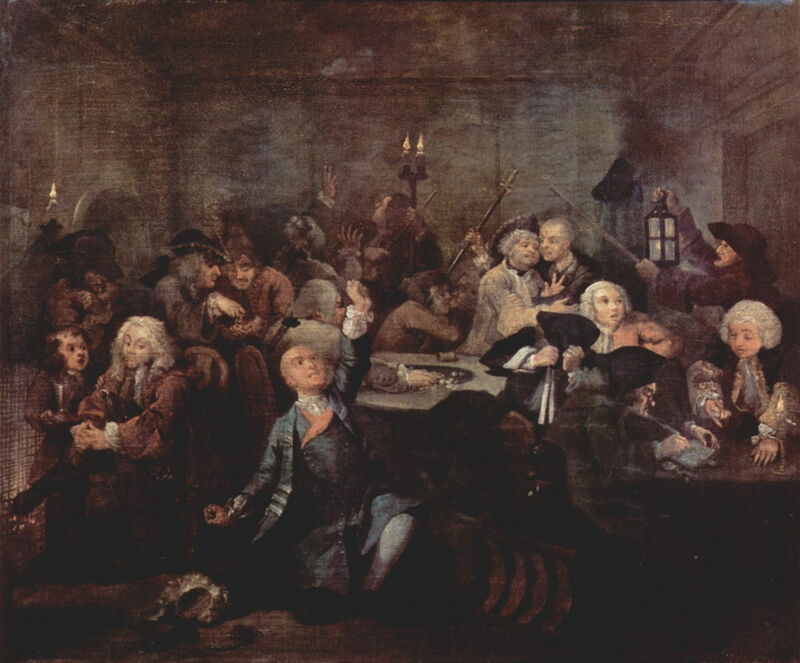 Drawing on their clay pipes and with glasses of beer in hand, a group of men appear completely absorbed in gambling their large stacks of coins on the throw of their dice. Salvator Rosa (1615–1673), Soldiers Gambling (c 1656-58), oil on canvas, 77.1 x 61.6 cm, Dulwich Picture Gallery, London. Wikimedia Commons. Salvator Rosa is more neutral in showing his almost timeless version of Soldiers Gambling, from about 1656-58. Change the dress, armour and weapons, and this could have been at almost any time in the last couple of millenia. 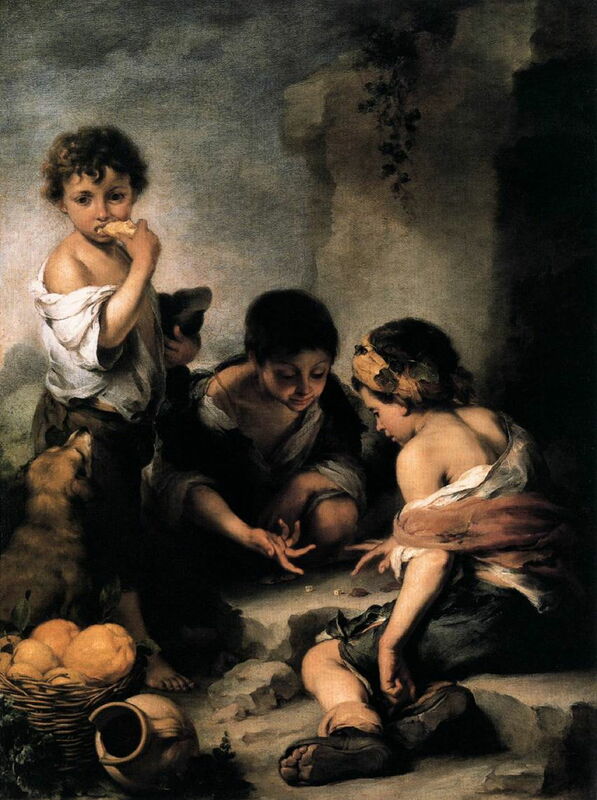 Bartolomé Esteban Murillo (1617–1682), Young Boys Playing Dice (c 1675), oil on canvas, 145 x 108 cm, Alte Pinakothek, Maxvorstadt, Germany. Wikimedia Commons. Murillo’s Young Boys Playing Dice of about 1675 takes up a new theme, of gambling among the extremely poor and vulnerable. Two scruffy urchins from the streets of Seville are throwing dice for the small piles of change which are probably their entire fortunes. A third stands over them, chewing at a bread roll while his dog looks up longingly at the food. Gambling was seen by the British moralising narrative artists of the eighteenth century as one more step on the road to sinful death. Tom Rakewell, the lead in William Hogarth’s series A Rake’s Progress, saves himself from his first decline by marrying money in the form of an ugly old spinster. William Hogarth (1697–1764), A Rake’s Progress: The Gaming House (1732-5), oil on canvas, 62.5 × 75 cm, Sir John Soane’s Museum, London. Wikimedia Commons. He then takes his new wife’s money off to a gambling den, where, surrounded by London’s low-life, he pleads to the Almighty for one last chance to recover his fortune (in both senses of riches and luck). Thomas Rowlandson (1756–1827), The Gaming Table (1801), watercolour with pen and brown and gray ink, over graphite on moderately thick, moderatedly textured, cream, wove paper, 14.9 x 24.1 mm Yale Center for British Art, Yale University, New Haven, CT. Wikimedia Commons. 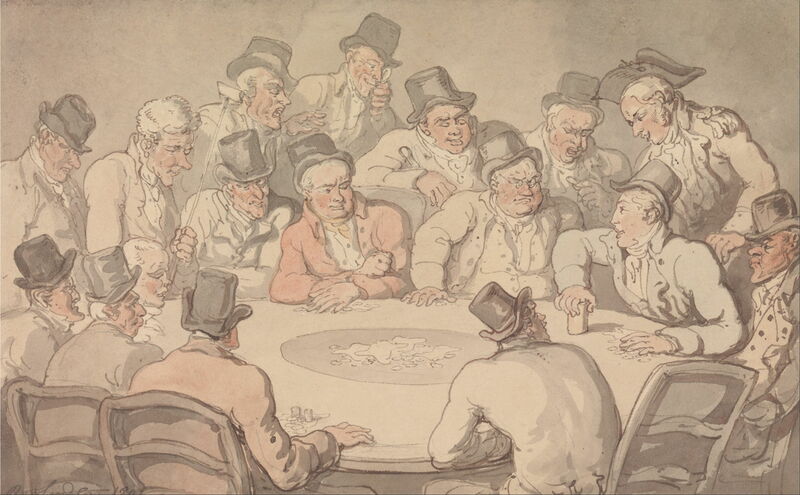 Hogarth’s successor Thomas Rowlandson finds a less chaotic scene at The Gaming Table, which he painted in watercolour in 1801. It still doesn’t look a friendly place, though, and there are no women present. The players here are putting their stakes on dice, which are about to be revealed by the man at the far right of the table, who seems to have been raking the money in. Eduard Swoboda (1814-1902), Va banque or Gambling (1849), oil on canvas, 94.5 x 126.5 cm, Österreichische Galerie Belvedere, Vienna, Austria. Wikimedia Commons. By the middle of the nineteenth century, though, some forms of gambling attracted a wider range of participants. 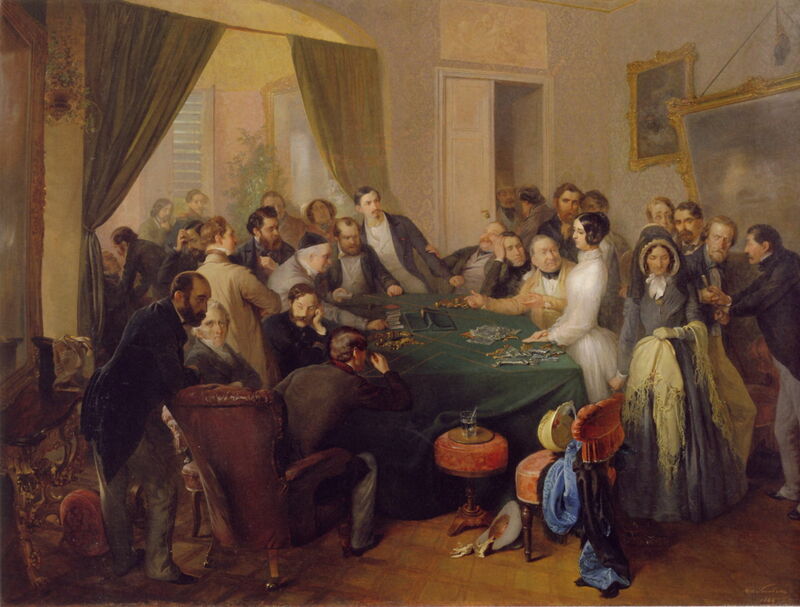 Eduard Swoboda’s Va Banque or Gambling from 1849 shows a salon in which the card game of Pharo or Faro is being played by a group containing several women, and more respectable men too. The term vabanque or va banque refers to a player betting a sum equal to the size of the current bank, in an effort to gain the whole bank, or go bust in the process. Swoboda shows a moment when the bank is currently in the hands of the older man wearing a skullcap (presumably a kippah to indicate that he is Jewish) to the left of centre. The young woman wearing a white dress and standing to the right of centre is thinking about whether to vabanque against him. I wonder whether she did, and whether she won or lost. Posted in General, Life, Painting and tagged Bosch, Caravaggio, de Boulogne, de la Tour, Hogarth, Murillo, painting, Rosa, Rowlandson, Swoboda, Teniers. Bookmark the permalink.